The EL2000 will change your expectations of what a telephone entry system should look like. The EL2000 is designed to complement virtually any gated community and is flexible enough to be used in apartment buildings, condo complexes, office parks and commercial sites. The EL2000 features a 5-inch backlit LCD screen; the unit clearly displays up to 4 lines with 20 characters per line, making it a great choice for multi-tenant installations. The EL2000 is capable of accepting up to 2000 totally flexible codes. These codes can be programmed as directory codes or access codes, making the EL2000 ideal for virtually any installation. Unlike other systems, the EL2000 may be purchased as a base unit or can ordered with optional plug-in modules. This allows you to choose only the plug-in modules you need depending on the specifics of the job- enabling you to offer custom solutions right off the shelf without special orders. Universal Board-The EL25 and EL2000 share the same main processing board, which makes it much easier to master the installation and service of both systems. Remote Access Diagnostics-The EL2000 will retain unit alarms within the system event buffer. 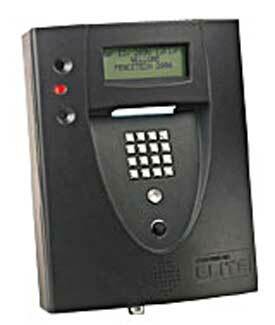 The unit will record the following alarms - forced door/gate; ajar door/gate - for added security. The EL2000 also records unit over voltage and under voltage alarms allowing for simplified troubleshooting of the system. E-Z Scan - Cards and Passport"' transmitters can be programmed into the EL2000 simply by utilizing the card reader or radio receiver installed into one of the plug-in modules. Enhanced Line Noise Tolerance - A new, more robust main board allows the EL2000 to be more tolerant of noise associated with the older telephone company equipment, providing a better connection to the unit via modem. Legacy Database Conversion - Replacing an existing Sentex® Telephone Entry System is a snap with Versa XSTM 2.0 software. Transfer any information retained in your existing Sentex® software database to Versa with the click of your mouse. Recessed, Lighted, ADA-Compliant Keypad - Illuminated keys with help button assistance to audibly announce the next key press on the keypad. Distinctive Ringing - Provides a unique double ring on the system's main telephone line to distinguish between a standard phone call and visitor request call. Entry Codes - Programmable codes can be time-restricted or established as one-time use only. Holiday Programming - Up to 16 separate holidays can be defined to override the standard lock/unlock schedules. Time Zones - Up to 62 different time zones with three segments each can be created for access/no access schedules. Anti-Passback - Timed anti-passback waits for a pre-programmed period of time to elapse before the code or card can be reused. True anti-passback requires use of an exit reader before entering again. Security Lockout- Locks out all users for a programmable period of time if several invalid code attempts are made. Alarm can be set to activate if the gate or door is held open or forced open. Transaction Monitoring - A minimum of 4,000 transactions are stored in the unit including date, time, unit ID and transaction. Activity Reports- Property managers have the ability to print database, system and history reports. Remote Updates- Firmware updates and upgrades may be made via a remote computer and modem connection. Plug-in Modules- Optional plug-in adaptability lets you expand the EL25 to work with many different types of controls. A two-reader Wiegand module lets you add card readers, keypads and prox readers, all with full activity tracking. An RF module with programmable Passport-transmitters provides convenient remote access control. Exclusive Security - An optional black and white or color CCTV camera ensures added security. A color low-lux camera compatible with DVRs is also available. Lighted Directory - A separate lighted paper directory is also available in gray, nickel, silver or black.